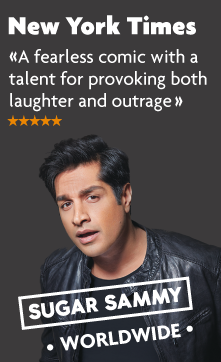 Sugar Sammy has once again extended his French tour by adding more shows at l’Alhambra Theatre in Paris as of April 4, 2019. Since fall 2016, he’s performed over 170 sold-out shows at Point-Virgule, Européen and Alhambra Theatres. His show is written specifically for French audiences and performed in pure American stand-up tradition: one microphone, no censorship, no holds barred! Sugar Sammy presents his vision of an Indo-Canadian who toured the world and is now discovering France. You'll fall under the spell of this charismatic provocateur. As a master of improv, every show is a one of a kind event.